Every family has its points of contention. For our family, Mother’s Day was an annual conflagration-in-waiting. My wife hated the notion of Mother’s Day Brunch on numerous grounds ranging from the culinary to the socio-political. My mother and sister had their own ideas that generally corresponded much more closely to American norms. There was little consensus to be found amongst us when it came to Mother’s Day. Then, several years ago, we found our own new tradition: sushi. Rather than engaging in the Hallmark Holiday practices of large restaurant crowds we decided to make our own sushi. It was a delicious idea that achieved consensus amongst the mothers. While the essence of good sushi is the rice – something upon which we still have to work – the other half of it is wonderful, perfectly fresh fish. 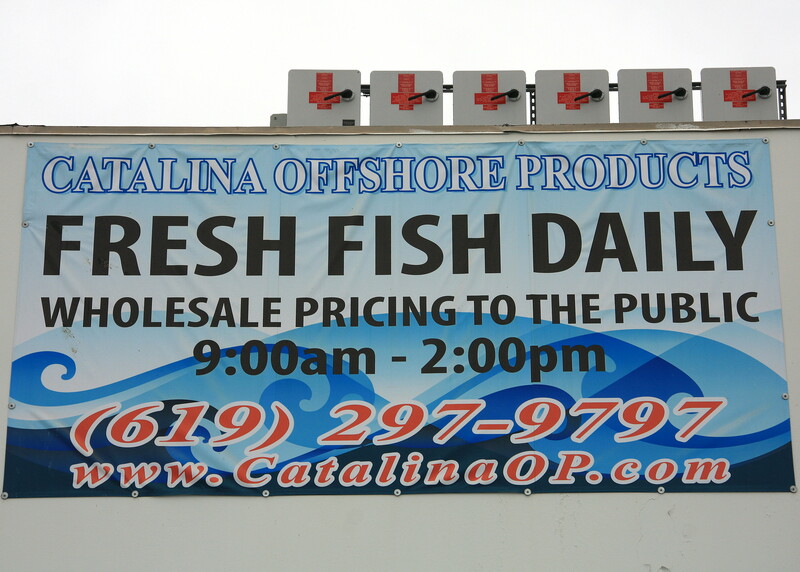 While there are a number of superb Japanese markets in San Diego’s Kearny Mesa neighborhood – Nijiya Market, Mitsuwa Market Place and Marukai San Diego, in particular – we started one step back in the supply chain: Catalina Offshore Products, a supplier to some of the best restaurants and sushi bars in the area that also sells retail to the public. It is one of the best kept foodie secrets in town. 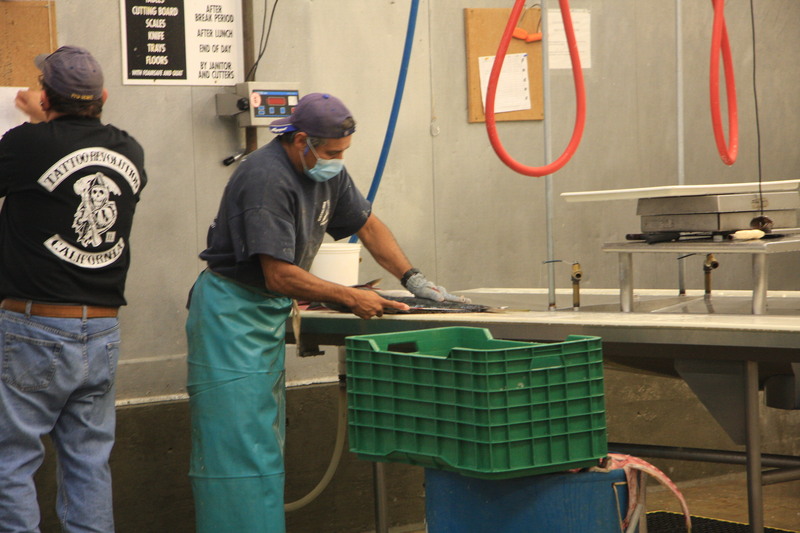 Short of catching it yourself it is impossible to get fresher fish than at a supplier who brings it back and processes it before your eyes. 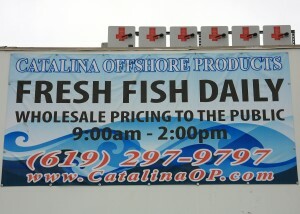 Every product at Catalina glistens. The quality of the fish is so great that even a complete neophyte cannot completely screw up the sushi. Put it on some rice, put it on the plate and it cannot help but be good. But as wonderful as the sushi was, the star of this Mother’s Day was a new addition to our new tradition: Chawan Mushi. 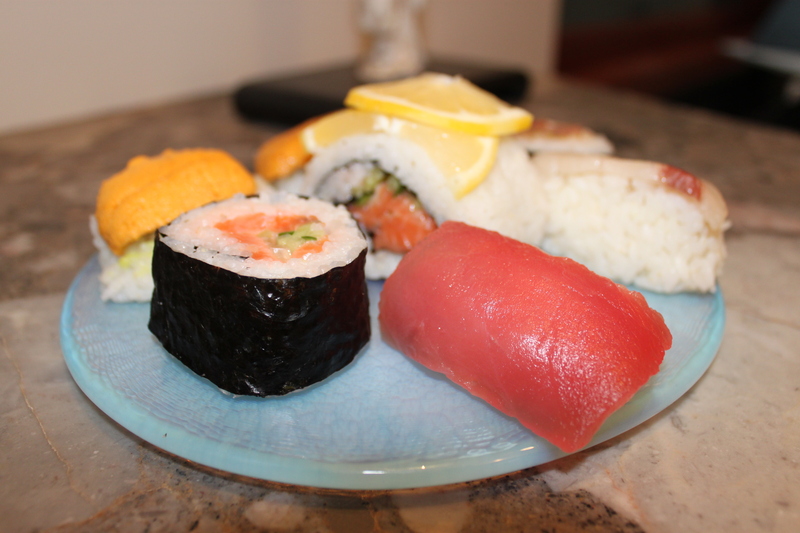 To most American’s the term “Japanese Food” immediately evokes images of Sushi. If not, it probably brings to mind gooey teriyaki, salty-sweet sukiyaki, or the flying knives of teppanyaki. For me, growing up, it was different. For me, the signature dish of Japanese cuisine has always been Chawan-Mushi. The moment that crystalized this for me was when I got to the bottom of my first Chawan-Mushi and found a little quail egg waiting for me. Ever since, this little savory custard cup full of surprises has come to symbolize for me both the simplicity and wonder of Japanese food. For this Mother’s Day we took the opportunity to feature the ultimate symbol (indeed, the defining feature) of motherhood, the egg, in numerous different forms. The main ingredient in the Chawan-Mushi custard itself is egg. Too this we added the traditional quail egg as well as three forms of fish eggs: wasabi-spiked flying fish eggs, yuzu-infused flying fish eggs and capelin roe. We gilded the entire dish with fresh uni, commonly referred to as sea urchin “roe” (it is actually the sea urchin’s gonads). While that might sound intimidating to the uninitiated, uni is one so-called “acquired taste” that is well worth acquiring. While the festival of eggs is perfect for Mother’s Day, , the more traditional chicken and prawns are perfectly fine substitutes. Similarly, if you do not have ready access to an Asian food market at which to acquire the ingredients to make dashi, do not let this stop you from making this dish: use light chicken stock. But if there is an Asian market near you – and in San Diego there certainly are plenty — by all means use (and get to know) dashi, the bonita and kelp broth that is at the heart of Japanese cuisine. Its subtle flavor adds an indescribable depth to this and many other Japanese dishes. While it pains me to say so, this dish can be made without the quail egg. But its well worth searching out if only to turn a mere custard into a treasure hunt. And for us, on this Mother’s Day, the ultimate treasure was peace amongst the moms. 1 teaspoon light soy sauce. 1. Prepare the Surprises. Place half the tatsoi (a Japanese leafy green that is similar to spinach) in the bottoms of each cup. On top of the tatsoi, arrange the three fish eggs and the quail egg. 2. Prepare the Custard. Start the water boiling for your steamer. Beat the eggs in a bowl to a smooth mixture. In another bowl combine the dashi, salt, mirin and light soy sauce. Be certain to maintain a 2 to 1 ratio of stock mixture to egg to stock mixture. If you have a higher ratio the custard will not properly set. Pour the stock mixture in a thin stream into the beaten egg, mixing well – but not beating – to combine. The surface of the mixture should not have any bubbles or foam. 3. Assemble the Custard Cups. Fill the cups to about a quarter inch from the top with the egg mixture and add the remaining tatsoi. 4. Steam the Custard. Traditionally, Chawan-Mushi is served in covered cups. If you do not have covered cups use whatever you do have and steam it wrapped in a covering of celophane paper or foil. Cover the cups one way or the other and set them in a hot steamer. Steam for 20 minutes. 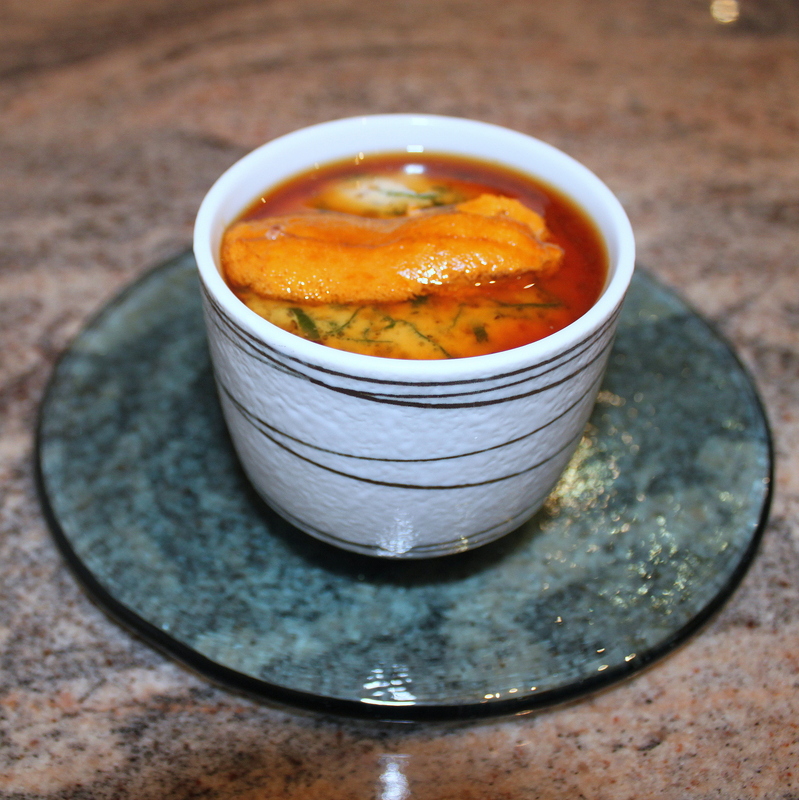 Just before serving the Chawan Mushi, uncover each cup and top with fresh uni. Drizzle some good quality soy sauce over the top of the uni.